LEINSTER’S TIMELY WIN over Ulster last night marked the midway point of the Pro12 regular season. Here’s how we think the reigning champions have fared as the season’s second lap comes into view. Leinster won’t greatly mind being seven points points behind Munster in the Pro12, because now they are second in the table and well-placed to let their squad keep their play-off push on track during the Six Nations. Matt O’Connor’s side are top of their Heineken Cup pool one, but things are a little bit more complicated in Europe. Ah, speaking of Europe; the great invasion of Northampton made all made all seem rosy in Franklin’s Gardens. The 7 – 40 win was a night when everything clicked for Leinster: six tries, extremely clinical work at the breakdown and chances galore. Seven days later, everything changed. In the Aviva Stadium it was the Saints who were rampant in the tackle area and Leinster unable to find any accuracy in attack. The overly festive atmosphere turned nasty, and this year’s ‘Fever in the Aviva’ became the most forgettable. A superb finish to a lightning quick break from Darragh Fanning’s turnover, the score showed the value of having both Ian Madigan and Jimmy Gopperth in the back-line. Sean O’Brien’s absence in the early stages of last season was one of the chief reasons for Joe Schmidt’s struggles in his final year as Leinster boss. Up until last night, he had pretty much been injury free and that has been a major influence in the O’Connor transition period being a relatively smooth one. If Pro12 champions’ biggest tests of the season to date came away to Ospreys and Northampton, then they need look no further than O’Brien as the stand-out back row on nights when their breakdown was nothing short of exemplary. Depending on the prognosis on his dislocated shoulder, his absence could be a massive blow to Ireland as well as Leinster’s bid for a home quarter-final. It’s little wonder that overseas clubs are having a wee sniff around the Baby Calf. Martin Moore has enjoyed a meteoric rise from Lansdowne to the big league and the 22-year-old topped it off with a rock solid display against the Lions in the Ospreys front row. Matt O’Connor’s task on taking over from Ireland’s new head coach was to keep a well-oiled machine ticking over. Factors outside his control have made that a difficult task – big names have taken their leave and an unforeseeable injury has weakened the front row. On occasions they have shown all the ruthless brilliance, vim, vigour and playing it as they see it of recent years, but when the go-forward ball runs out they too often have ran out of ideas in the back-line. O’Connor’s early games in charged were characterised by a reliance on a fine rolling maul, but a more rounded approach has taken hold as the season has worn on and Lote Tuqiri has ended his pretty woeful short stint back in the northern hemisphere. 10. 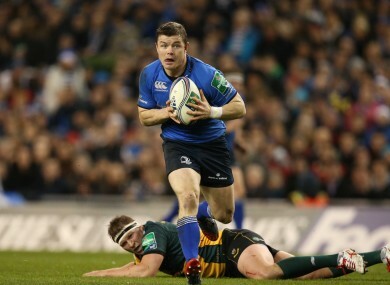 One factor which certainly does not appear to help Leinster settle in to a consistent performance pattern is the absence of a clear-cut first choice out half. Ireland’s other three provinces have named their top 10 and even with competition still flourishing, their results have benefited. Ian Madigan had the reins for both the high and the low points of the season so far. But while many expected Jimmy Gopperth to come to UCD and politely collect his second fiddle money, the Kiwi has instead deployed a steady hand when it has been called for and no shortage of creativity in attack. It’s a tough call on the new coach, but that’s the job he faces when the Heineken Cup gets real in 2014. Seven – They’ve done so much right, but there is so much to improve upon before another transition comes with the absence of Brian O’Driscoll and Jono Gibbes next season. Email “Half-term report: Leinster ship yet to be steadied”. Feedback on “Half-term report: Leinster ship yet to be steadied”.